In many fields it is now desirable to sequence large panels of genes for mutation, to aid management of patients. The need for extensive sample preparation means that current approaches for assessing mutation status in the clinical setting are limited. A recent publication demonstrates a single-step, targeted, true single-molecule sequencing approach to assessing the mutational status of BRCA1. Fragmented DNA samples are loaded directly onto a flow cell and sequenced, thus detecting both small- and large-scale mutations with minimal sample preparation and high accuracy. In a recent article in Genome Research , Thompson and colleagues present a development of a next-generation sequencing technology - the HeliScope sequencer - that enabled them to detect mutations in the human breast cancer 1 (BRCA1) gene, as a model of a clinical diagnostic protocol. Their technique is accurate and requires limited sample preparation before sequencing. It therefore holds great promise for overcoming the emerging problem in clinical genetics of target overload: the presence of a large number of gene mutations of clinical relevance in a single disease entity. In no field is this challenge more apparent than in the genomics of cancer. The past few years have seen an unprecedented deluge of data on the genes mutated in cancer and other diseases. So far, the sequences of over 50 individual cancer genomes have been published and this number is set to increase exponentially. The advent of next-generation technologies (such as the Roche 454 GS FLX+, llumina Hiseq 2000, Applied Biosystems SOLID and HeliScope single-molecule sequencer machines), which allow a human genome to be sequenced in a single week-long run, has led to a large shift in our understanding of the mutations that drive cancers . For the clinician, mutations in cancer can have relevance for diagnosis, prognosis and treatment choice. However, it is now apparent that these clinically relevant mutations will be both numerous and found at low prevalence in individual cancer types. In particular, for the majority of cancers there will be no single 'magic bullet' targeted therapy. The breakpoint cluster region-Abelson murine leukemia homolog (BCR-ABL) fusion kinase, which is characteristic of chronic myeloid leukemia, is the exception not the rule when it comes to druggable cancer genes; it seems, instead, that multiple drug targets will be mutated at low frequency throughout common cancers . This target overload is not restricted to the management of cancers and is also seen with monogenic disorders, for example, mental retardation and hereditary cancer pre-disposition . It is therefore necessary to screen numerous genetic loci to decide on the best course of clinical management for an individual patient and this must be done in a rapid and cost-effective manner. The current technology for searching for mutations is to amplify a region of interest - in multiple fragments of a few hundred base pairs each in separate PCR reactions - then sequence the products by standard Sanger chain terminator sequencing. Although highly accurate for the detection of single-nucleotide variants and small insertions or deletions, this approach is expensive, labor intensive and unable to detect large-scale insertions or deletions. Furthermore, in tumor samples, mutations may be missed. This is because Sanger sequencing can reliably detect mutant alleles only when they are present in more than about 20% of the relevant DNA, and this will not be the case, for example, for a heterozygous mutation in a tumor contaminated with 60% normal DNA, a scenario that is not uncommon . 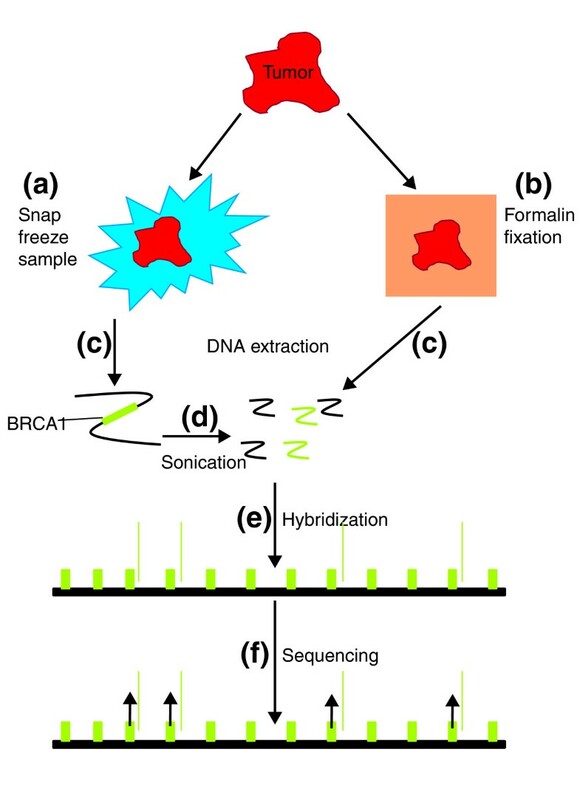 Thompson and colleagues  have used a next-generation true single-molecule sequencing (tSMS) system, the HeliScope sequencer, to profile the mutational pattern of the human cancer gene BRCA1. Germline mutations in the genes BRCA1 and BRCA2 are associated with dramatically increased rates of breast and ovarian cancers and contribute to about 10% of all breast cancer cases . In addition, poly-ADP ribose polymerase inhibitors, a recently developed family of pharmaceutical agents, seem to show selective toxicity for cancers with mutations in the BRCA genes. Cost-effective sequencing of these genes is therefore a highly desirable clinical tool for the management of breast cancer patients and those with strong family histories of the disease. The technology used is a development of the HeliScope tSMS platform . In the standard HeliScope protocol, DNA is fragmented and poly(A) adaptors are added to the ends of fragments. They are then captured on a glass slide coated with covalently bound poly(dT) oligonucleotides, and sequenced . Thompson et al. were able to dispense with the initial sample preparation steps (addition of poly(A) adaptors and 3' blocking - performed to prevent extension of the 3' end of bound poly(A)-tagged DNA molecules) and instead directly captured only the fragments of DNA belonging to the BRCA1 locus, using oligonucleotides that match sequences in the BRCA1 region (Figure 1). This targeted capture approach was highly successful. Approximately 20% of the sequenced reads mapped to BRCA1, which equates to about 100,000-fold enrichment of the target sequence. As the length of sequence that can be read in this system is limited, oligonucleotides were designed at 20-30 base pair intervals throughout the coding sequence of the gene, to ensure complete coverage. Importantly, the authors  were able to obtain sequencing results from as little as 100 ng of input material - thus showing that the technology could be used with samples collected as diagnostic biopsies. Outline of the tSMS gene capture approach. Tumor material can be collected and (a) snap frozen to preserve intact DNA and RNA or (b) fixed in formalin then embedded in paraffin for section and histopathological review. Following (c) DNA extraction, (d) the DNA is broken by sonication to approximately 200 bp fragments. Green, sequences from the BRCA1 region; black, other regions. Formalin fixed material provides fragmented DNA, removing the need for a sonication step. (e) DNA fragments are hybridized to the flow cell, which is covered with oligonucleotides with sequence complementary to the region corresponding to the BRCA1 gene. BRCA1 sequences are therefore enriched on the flow cell. (f) Each individual molecule of DNA is then sequenced simultaneously by sequential addition of fluorescently labeled nucleotides (purple). This approach  has several advantages over the more traditional Sanger sequencing commonly used for the detection of mutations. Firstly, there is little required in the way of sample preparation - only sonication of the DNA, and in the case of archival formalin-fixed material it is possible that even this step could be dispensed with - therefore reducing cost, turn-around time and the risk of errors in sample handling. Secondly, unlike Sanger sequencing, the HeliScope system allows the detection of large deletions, by determining the number of fragments of DNA that are present from a specific location; a decreased number of fragments from a region suggests a loss of genetic material. Finally, the HeliScope system directly sequences individual molecules rather than - as with Sanger sequencing - examining the average sequence of many millions of DNA molecules. This should provide increased sensitivity for the detection of low prevalence mutations, an essential feature in the sequencing of a heterogeneous cancer sample. The present technology  is an advance over recently presented techniques for analyzing the mutational status of target genes using next-generation sequencing instruments [8, 9]. With the advent of more competitively priced next-generation sequencing machines, which can provide sequence data in a matter of hours, not days (such as Life Technologies' Ion-torrent and Illumina's Miseq), it is feasible that such approaches could be used routinely in the clinical setting. However, the instruments involved still require the selective amplification of target DNA and the relatively complex preparation of this material for sequencing. Thus, although they take advantage of the exceptionally cheap per-base cost of next-generation sequencing, competing techniques are still limited by its flaws: high complexity and slow turnaround time. Genotyping by mass spectrometry has also been applied to the resequencing of relevant mutations . This approach, although sensitive, is limited, in that it is capable of detecting only known mutations and will therefore miss novel gene lesions. For the foreseeable future, the high cost and complexity of data analysis will limit the application of whole-genome sequencing for the detection of mutations in a clinical setting. Targeted resequencing of areas of interest will therefore remain key to determining mutational status. The method published by Thompson et al. is a stride forward in putting this into practice. Although currently only a single gene is screened, there is clearly scope for the creation of multi-gene capture arrays, allowing large numbers of loci to be analyzed rapidly and cost-effectively with low DNA input requirements. In its simplicity, this approach provides an opportunity to truly begin integrating the vast quantity of genomic data generated in this next-generation era with clinical practice. We would like to thank Claire Pike and Karen Howarth for helpful discussion and reading of the manuscript and the Wellcome Trust Translational Medicine and Therapeutics program, Breast Cancer Campaign and Cancer Research UK for funding.